Whether you’re going through menopause or have a medical condition that causes you to produce excess sweat, hot flashes can be difficult to deal with and embarrassing. But a cooling pillow can help keep you dry at night and keep your night sweats to a minimum. Cooling Method: What makes the pillow cooling? Is it made of gel memory foam, or some other cooling material? Just because a pillow says that it’s cooling in the product description, that doesn’t mean it is. Learn more about the material to make sure that it will actually keep you cooler and help you combat your night sweats. Firmness: The firmness of the pillow may not be quite as important as the previous factor, but it’s still something you should consider. If you’re a side sleeper, a firm pillow is usually the best option because it provides your neck and shoulder with the support it needs. If you’re a stomach sleeper, softer and thinner is best, and back sleepers can usually get away with sleeping on any pillow, although medium is usually the preferred choice. Quality: Last, but certainly not least, you want to consider the quality of the pillow. A good pillow isn’t cheap, especially one that’s designed to keep you cool. Remember that you spend a large percentage of your life sleeping and sleep deprivation can lead to serious health issues. Reversible Cool Gel Memory Foam Pillow by Classic Brands – Classic Brands’ reversible memory foam pillow is gel-infused, and gives you the best of both worlds. You can choose to sleep on the cool gel side, or the regular memory foam side. The memory foam side is medium-soft, while the cool gel side is medium-firm. The entire pillow is five inches thick, which makes it comfortable for both back and side sleepers. On the cooling side of the pillow is a gel pad that disperses your body heat while creating a cooler sleeping surface. The pad is surrounding by conforming memory foam to give you the support you need, and a removable knit cover provides a soft sleeping surface. Because the gel cooling pad is so close to the surface and does a great job at dispersing body heat, this the best menopause pillow – hands down. PharMeDoc Memory Foam Pillow – If you’re looking for a firmer pillow with a bigger cooling gel pad, PharmMeDoc’s cooling memory foam pillow may be the ideal choice for you. Extra-firm at first, it will take a few days to break in this pillow, but once you do, you’ll enjoy a deep, restful sleep. The cooling gel is built into the pillow, so you never have to worry about it slipping or breaking off. The gel pad spans nearly the entire length of the pillow, so even if you toss and turn at night, you’ll still stay cool. A removable and breathable knit cover is included to protect your pillow. The cover is machine-washable, which makes it easy to keep your pillow clean. As a budget item, this pillow is a great option for anyone with serious night sweats that needs maximum cooling gel relief. Reversible Gel Memory Foam Pillow by Sleep Innovations – Want a cooling pillow, but don’t like the feel of a cooling gel pad? Sleep Innovations has just the thing: the reversible gel memory foam pillow. A top layer of gel memory foam keeps you cool without causing any discomfort. And like the Classic Brands pillow, this one is reversible, so you can sleep on the cooling side, or the premium memory foam side. What makes this pillow unique is that it’s built with SureTemp memory foam, which offers optimal support and airflow to keep you cooler at night. The entire pillow is made of this premium foam, and the one side offers an additional layer of gel-infused foam. A machine washable cover is included, too, which offers superior protection for your pillow. PharMeDoc Contour Memory Foam Pillow w/Cooling Gel – If you want to enjoy the benefits of cooling gel but prefer to sleep on a contour pillow, PharMeDoc has the right solution for you. 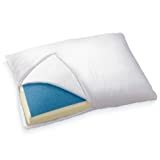 This contoured pillow is similar to the other PharMeDoc pillow listed above. It has an extensive cooling gel mat to keep you cool no matter where you lay your head. And the contoured shape provides excellent neck support. Plus, the included knit cover is removable, which makes it easy to keep this cooling pillow clean. Contoured pillows are the best option for side sleepers because they provide superior neck support and eliminate pressure points in the shoulder area. 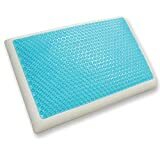 Frosty Pillow Gel Mat – Cooling Pillow Mat – Maybe you want to stay cool at night, but don’t necessarily want to invest in a whole new pillow. That’s where the Frosty Pillow Gel Mat comes in. Soft and comfortable, this pillow mat is like sleeping on a cool cloud of air. The mat can be placed on top of your regular pillow, either inside of the pillowcase or on top, and it can do more than just prevent hot flashes. It can also help bring down fevers, get rid of neck pain and alleviate migraines. What makes this mat so cooling? Inside is a safe gel that keeps the surface of the mat cool. The gel is locked safely and securely inside of the mat, so you don’t have to worry about it leaking on your face or your bed. And if you want an even cooler night of sleep, you can put the mat in the refrigerator to keep it cooler for longer. Buying a pillow (cooling or not) is a personal decision, and what’s right for you may not be right for someone else. With that said, there are some things that you should be on the lookout for when looking through the dizzying array of pillows on the market. Material: There’s a chance that it’s your old pillow (or even your mattress) that’s causing your night sweats – not you. Make sure that your pillow is constructed with materials that are naturally cooling. Regular memory foam can actually make you sweat at night (read more about the heating effects of memory foam). The good news is that gel infused memory foam is actually cooling. This material allows for better airflow, so you stay cooler at night. Size: The size of the pillow is important, too. Make sure that you choose a pillow that will fit your bed and your head comfortably. If you have a queen size bed, don’t buy a standard size pillow. And if you need maximum relief, look for a pillow with gel padding that covers the entire surface of the pillow – not just the center. Price: We would all love to run out and buy the absolute best, high-end cooling pillow out there, but that’s not feasible for most of us. Set a budget, stick to it, and buy the best quality you can in your price range. The cheapest pillow probably won’t give you the relief you need, and may even make your sleep even worse. Always go for quality, even if that means spending the most you can afford.